Some people have a hard time knitting with cotton yarn, because well, it’s often hard, hard to the touch that is. 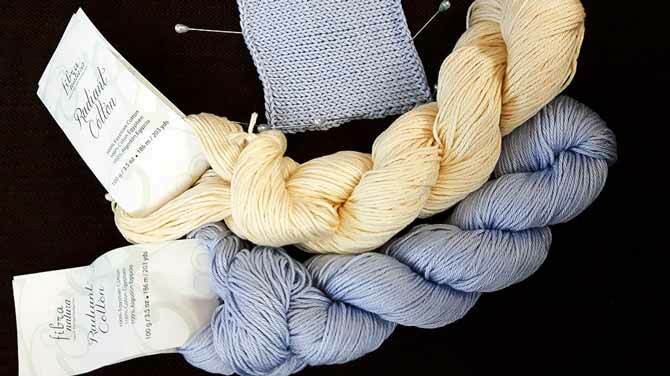 Knitting with Radiant Cotton may just change your mind about cotton yarn though, because it’s soft and once knit, there’s some body and elasticity to the fabric. This week we’re looking at this cotton yarn by Fibra Natura. Yesterday, I described Radiant Cotton’s architecture and qualities, and today we’ll look at some other characteristics. 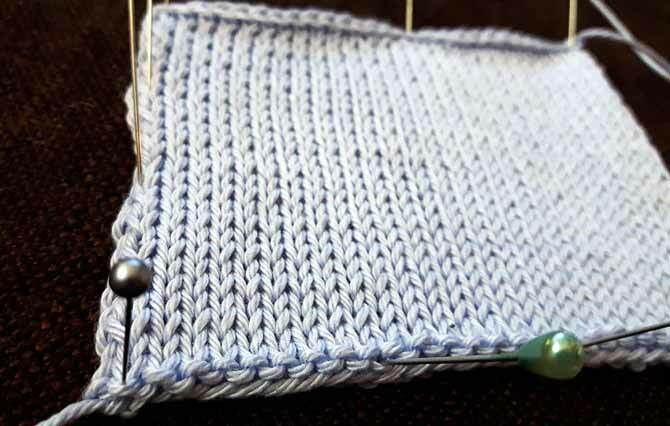 When I knit this stockinette stitch swatch, I used US size 6 [4mm] needles and achieved a tension of 24 sts and 32 rows per 4″ [10cm]. So that’s on the lighter side of a DK, more like a Sport weight, but maybe it’s just me. The ball band recommends US size 5 [3.75mm] needles to achieve a 22 st/28 row gauge. I’m not a tight knitter, generally, but I guess I’ll go up a size or two to achieve ball-band gauge if necessary. My swatch has a lovely drape, despite the “tighter” gauge and the hand of the fabric is very pliable, has as much elasticity as your average cotton T-shirt yet it feels much more luxurious. While these two colors of Radiant Cotton are serene and understated, there are 22 other colors, many of which are bright and saturated. It is easy to wind balls off of these hanks without any struggles with tangles. More about the information on the ball band, or label in this case. Each hank of Radiant Cotton weighs 100g and contains 203yd (Okay,186 m). The hank must be wound into a cake on a winder or into a ball by hand before knitting, but I had zero struggles when winding it off the swift. There were no tangles in the hank and the ties around it were made with each of the two ends, and the label was the third “tie” keeping the hank strands in order. Another tidbit of information, once knit up, you can machine wash and tumble dry your knit item…another great reason to use this yarn to knit children’s items, too. 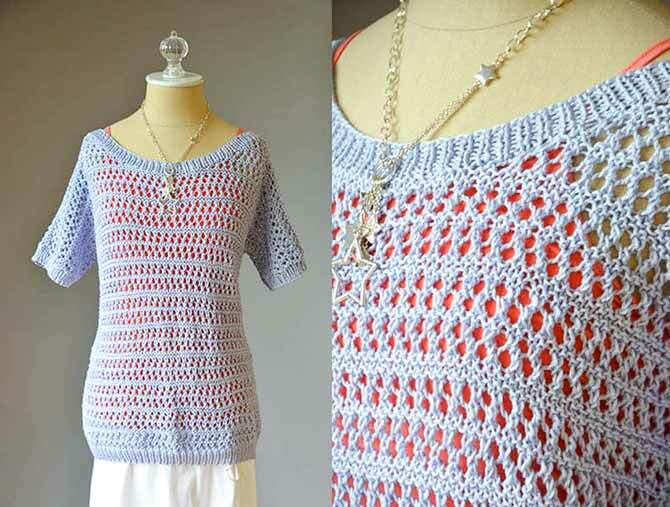 The Lucky Star Tee, a free pattern that uses between 4 and 6 hanks of Radiant Cotton in the Viola color. 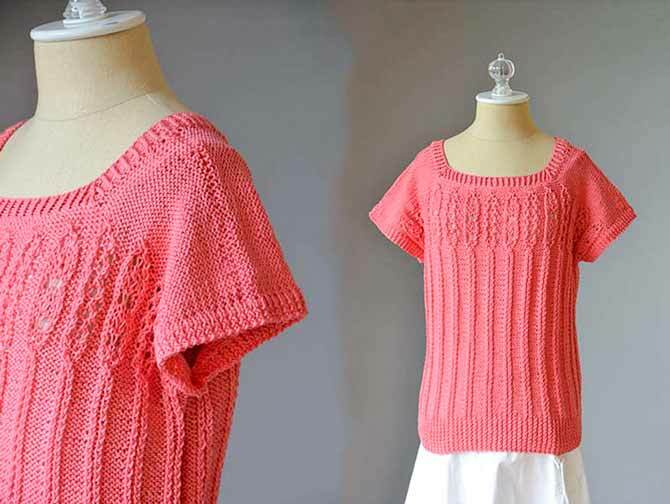 Universal Yarns offers two free patterns for Radiant Cotton and they’re both lovely spring or summer tops. The Lucky Star Tee features rows of mesh lace with a few solid rows separating the bands of eyelets. There are six sizes from XS to 2X and these are knit with from 4 to 6 hanks of Radiant Cotton, which shows how ample the yardage of this yarn is. The other pattern is the Down the Lane Tee, which debuts a twisted vertical rib through the waistline up to the bodice which that morphs into a lace panel. It’s a square scoop neck and the sleeves are worked in one piece with the body pieces. It comes in 6 sizes as well from XS to 3X. Radiant Cotton in Calypso, a bright salmon pink, is knit into this slimming summer tee with simple cap sleeves. As you can see from these two patterns, Radiant Cotton yarn is excellent for lace knitting and tomorrow, I’ll share my explorations into designing a lace pattern for a wedding stole or a summer scarf. I would like love to have one of these shirts for the summer. These would be great to take on vacation to wear with a long flowing skirt. I think these are beautiful projects that I would love to wear! Love The Lucky Star Tee!! I’m excited to start making one myself.